“I’ve had so many hugs today. It’s a hug fest,” says Jo Nixon, as I give her a hug to say hello. She’s just working up to her annual four-day adrenalin rush which gets her through the Beanie Festival, coming of age on the weekend: 21 years ago it started with 100 beanies. This time there will be 6650. Jo (at left in the photo) runs it, again. I’m trying to sidetrack her: The problems with tourism in Alice Springs is that it happens in fits and starts: Finke, Camel Cup, Henley on Todd and so on – one to four days and big breaks in between. Could she have a few apprentices perhaps, or get herself cloned? Given that there will be 7000 people through the gate this year, half of them from interstate and 10% from overseas, it’s a safe bet there are more. No go. It just wouldn’t work. 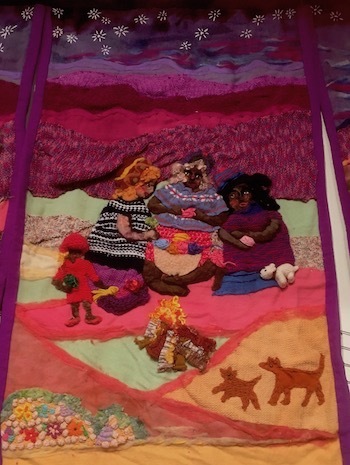 AT LEFT: If they don’t make a beanie they make a quilt showing women making a beanie. The Beanie Festival is a women’s thing. The blokes come along, have a look around, oh no, just another craft show. But before they know it they are carrying tables and chairs, cooking a barbie or hanging fishing nets from the ceiling to which hundreds of beanies are fixed for display and sale, or doing whatever else they are told – by their women, of course. “They all are pretending they are having a love affair with me,” says Jo. 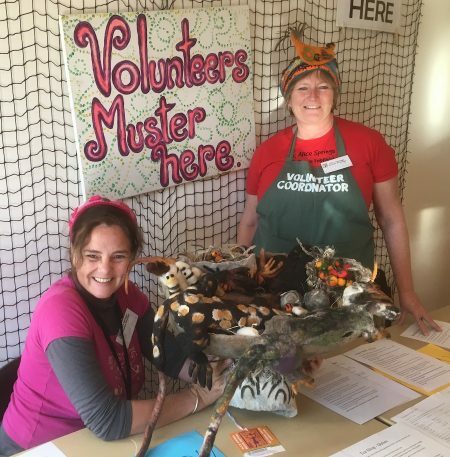 Being a volunteer is half the fun – and Deb White (at right in the photo at top) has a whole table covered with nomination forms for different time slots and tasks. In fact, the great majority of the crowd have been to the Beanie Fest before – and they’ll be back next year – many of them grey nomads in their rigs, feeling ever so young again. In fact, many come to volunteer – they’ve made mates doing it. The winter headgear from The Centre ranges from the practical (you just put it on and feel warm; apparently 40% of your body heat escapes through your head), to the extravagant which you probably wouldn’t put anywhere near your head: The one pictured with Jo (at top) was made in part from a bloke’s beard. Pubic hair next? Why not. It all starts at noon this Friday, at Araluen, of course. See you there – for a hug. PHOTO above right: The committee this afternoon in Witchetty’s, the place where the 6500 “wearable” beanies will be displayed. From left – Phil Walcott, Jess Abbott, Anita Suich, Kris Malenski, Deb White and Jo Nixon. The “exhibition” beanies – those that aren’t principally for wearing but are pure art, are shown in the main Araluen gallery, and will be on display for four weeks. Delighted to be a part of this wonderful 21st celebration of “all things beanie”. 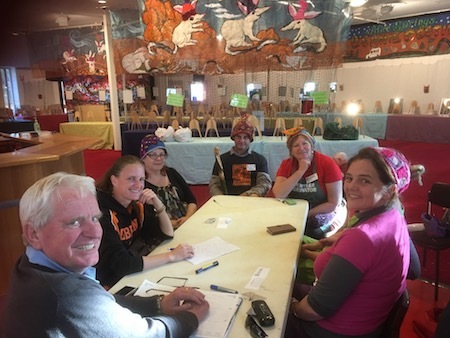 Such a fantastic team of committed volunteers who bring this event to the people of Central Australia each year is a pleasure to be associated with. Thanks to the committee and all of our fantastic volunteer network who contribute so much to the event in June and throughout the year. 21 and growing well. Beanie on!! !